China’s People’s Liberation Army Navy and the U.S. Navy will conduct a joint naval drill this week involving communication exercises and a surface rescue operation, Defense News reports. 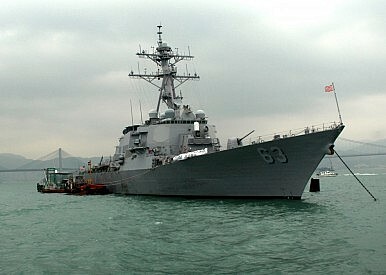 According to a U.S. Navy press release, the Arleigh Burke-class guided-missile destroyer USS Stethem (DDG 63) arrived in Shanghai this Monday for a scheduled five-day port visit. The visit is meant to promote “maritime cooperation and reinforces a positive naval relationship with the People’s Liberation Army Navy (PLAN) East Sea Fleet,” the press release said. The East Sea Fleet was the first naval force created by the People’s Republic of China. Its area of operation includes the East China Sea. The commander of the U.S. Pacific Fleet, Admiral Scott Swift, arrived as well this Monday and held consultations with the commander of the East Sea Fleet, Admiral Su Zhiqian. This is the USS Stethem’s first visit to Shanghai. According to China Military Online, U.S. sailors will have the opportunity to visit Chinese warships docked at Wusong naval port, and Chinese military personnel will be able to tour the American guided missile destroyer. The USS Stethem’s crew consists of 365 men and women, including 26 officers, 24 petty officers and 315 enlisted personnel. A basketball match and a visit to the Shanghai School for the Blind Children is also on the agenda, as are visits to some of Shanghai’s tourist sites. After the port visit, the USS Stethem will hold naval drills with the People’s Liberation Army Navy, including a joint rescue operation with Chinese warships near the estuary of the Yangtze River, as well as communications exercises involving the Code for Unplanned Encounters at Sea (CUES). The CUES was adopted in April 2014 by the West Pacific Naval Symposium (WPNS), with the aim to facilitate clearer communication at sea. The code is a voluntary code rather than a binding agreement and has been criticized as insufficient to maintain maritime stability in the Asia-Pacific region. The port visit follows the dispatch of the USS Lassen, another Arleigh Burke-class destroyer, within 12 nautical miles of China’s man-made islands in the South China Sea last month. “Sometimes countries might have some disagreements, yet our navies are able to operate safely at sea,” Marsh told reporters on Monday in Shanghai.